I have always had issues with conformity. So when I see something that a lot of people have, I tend to not want to fall in line. 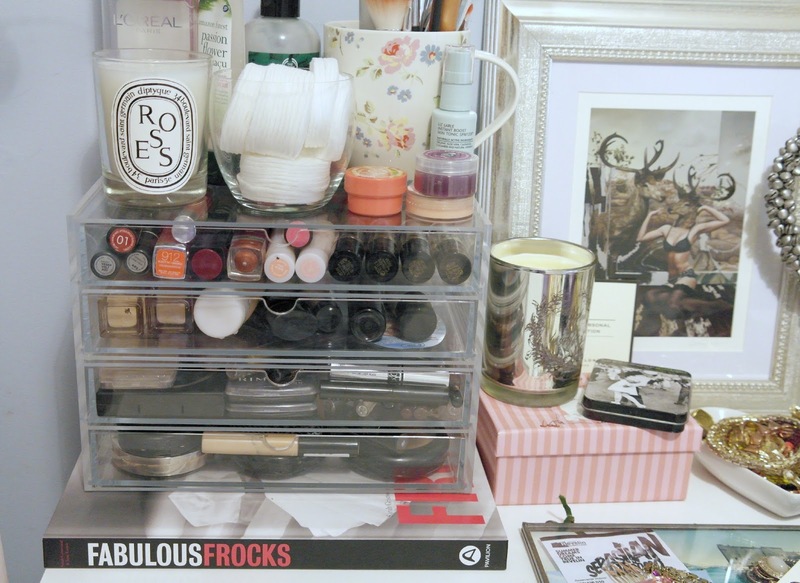 You can’t look at a beauty blog without seeing photos of the ubiquitous Muji storage pieces. They’re all artfully done, on the white dresser or bureau, with Diptyque candles and flowers. (Come on, they’re ALWAYS white and there are ALWAYS Diptyque candles.) It’s so bad, it makes me want to change the color of my dresser.) (Who knew I was being so ahead of the curve when I chose white as the accent color to my periwinkle walls.) And of course it makes me want to swear off Muji storage forever. But. Guys. I’m hurting. My cosmetics are scattered around in different places, in different storage pieces, in different ROOMS, even. You freaking can’t fit things in sections that shape. Not well, anyway. So I’m back to the drawing board with storage, and Muji is calling my name… I wish it was less pricey so I could get it immediately, but for now, it’s firmly on my wishlist. If I keep them away from any candles and flora, does it count as being antidisestablishment anyway? Do you have an Muji storage? Do you like it? Or what do you use to store your stash? I really want muji EVERYTHING but I prefer things being away and out of sight. Mine make up is in Ikea wooden drawers which I painted to match my room at the time but I now want alllll white err'thang! haha I didn't want these as its what everyone had and I wanted to find something unique but I think I need them, like you I am running out of space, and my make up needs to be kept high and secure from small fingers so I am thinking about getting these to go into my wardrobe and then fixing a little child lock on my wardrobe! My son will be upset he can't get to my shoes anymore! And I'm with you. Maybe if I paint them or something, I won't feel as bad? Hah. The prices seem reasonable, so why not? I have dreams of finally having my own vanity table. I kind of want a vanity desk with a lot of drawers, to put all my bags of stuff in but the clear drawer system looks good too. I can't wait to go to Bed Bath & Beyond! Because you have to get several pieces, and at $30 a pop, it adds up. Right now I just can't. 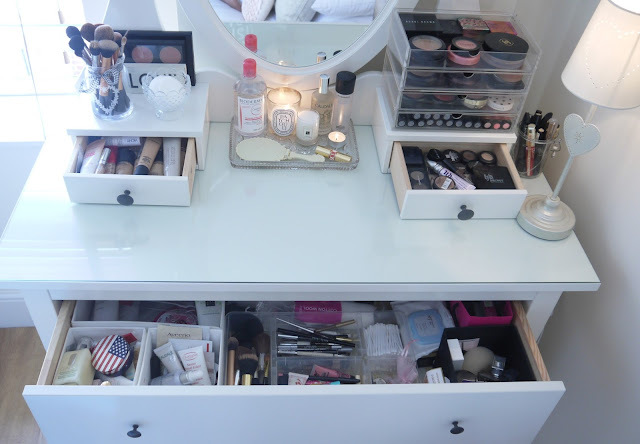 My dream is one of those Ikea vanity desks with the drawers with compartments… Oh, le rêve! I like the way they look, too. Although I wonder if I would need too many to make it worth it. I also have Sterilite drawers, but I really need to buy organizers for the drawers for them to work for me. Those drawers are super nice! That's another good idea, thank you! Aw man, if only that first spinning organizer was designed just a little bit better! Other than the whole triangular storage thing (???) it looks like a magical makeup carousel. EXACTLY!! It looks amazing and then you get it and realize how DUMB the people were who designed it. Who makes triangular shelves for cosmetics storage?! Sigh. If I ever get to the point where my makeup needs a storage container that size, I think everyone I know will wonder what's happened to me! However, I'm a general fan of fun storage solutions (I think I blame this on a home reno addicted father/childhood) and I do really like that it's clear and you can see into it and know what's in it! Hahahahaha everything IS relative, because to me, those are a little small. I was trying to figure out how many I would need! I do like that it's clear and you can see where everything is. It's definitely on my list.